The earlier 2 posts about the aqueous mounting media we made has a third update. 3 different labs to date has used our homemade aqueous mounting media with great success. It has been used flawlessly on fluorescent antibody staining and special staining (oil red O) for histology techniques. The current alternative to making it is buying it from 1 of many companies for an outrageous amount of money. I wonder if one manufacturer makes large batches of it, then sells it to the different retailers? What do you think? The protocol needs a little tweaking as it’s very thick and I don’t think it needs to be. There’s also the antifade agent (Either p-Phenylenediamine hydrochloride: 100 mg or n-propyl gallate: 500 mg) that is optional to add. I did add it to the mix, using p-Phenylenediamine and it turned the liquid brown. After doing this I and others had doubt about its effectiveness, but it worked and the brown color had no effect on the fluorescence or ORO. I think next time I make it, I will use less antifade. I remember making this stuff because it took so long, about 4 hours. Of course, this was the first time and I was doing 10 other things besides this. As promised, the recipe for this solution is copied here. This is found on John A Kiernan’s website http://publish.uwo.ca/~jkiernan/aboutjk.htm, histology books and papers he has written or contributed to. Thank you John for giving us your insight into the world of histology, you have truly made difference to so many people! This is my favorite aqueous mounting medium. The composition can be varied according to each need (Kiernan, 1990). 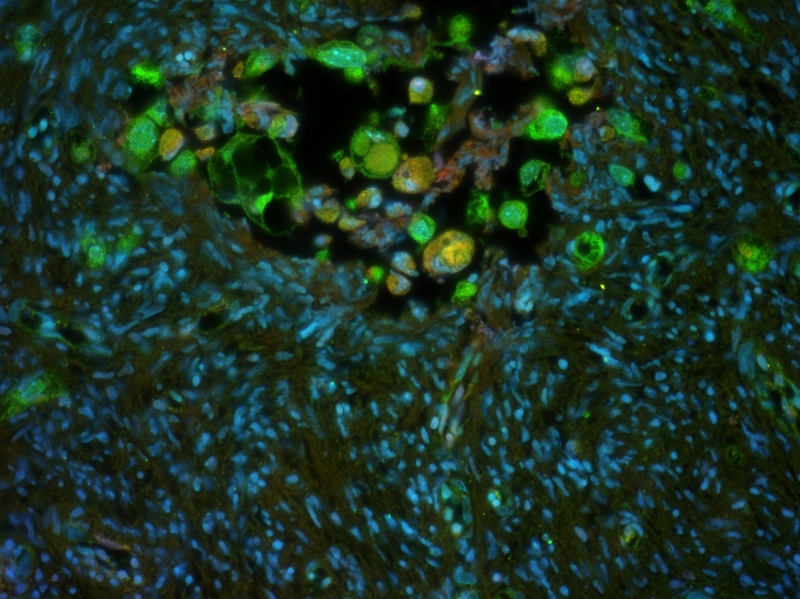 For immunofluorescence, make it up in a buffer and add an anti-fading agent. Bottles of PVP medium usually keep for 2 to 3 years at room temperature. Keep it in a dark place if an anti-fading agent has been added. Discard if it looks infected or becomes too viscous. This mounting medium is more runny than glycerol jelly or Apathy’s. It is very easy to apply, and not prone to bubbles. The refractive index is 1.46 (Pearse, 1968), but increases as the water evaporates at the edges of the coverslip until unstained structures are barely visible. If you want a high degree of transparency, wait several days before sealing the edges of the coverslip.